When you’re searching for a high quality individual threaded round eye plate, or any quantity of them, then look no further than our amazing range at Rope Services Direct. Threaded round eye plates are primarily used for securing chains, wire and rope to a range of different types of walls and posts. Ideal for use commercially and in the marine industry as well, they are incredibly versatile too. Additionally, they are great for use in demarcation for car parks and segregating off different areas of land too. 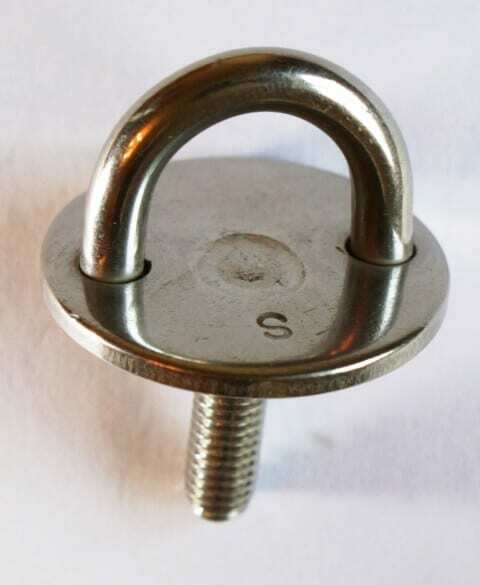 Made of non-rust high grade steel, the thread part is simply screwed into the wall or post ready for the chain or rope to attach to. Not entirely convinced it’s a round eye plate with thread you really need? Sometimes it’s difficult to know exactly what to choose, so why not also have a look at our range of snap hooks and lifting shackles as well. Plus, we have a large variety of wire rope to use with your round eye plate too. Rope Services Direct is very pleased to offer a large selection of colours and sizes of round eye plates with threads all under one roof. To order your link, you’ll just need to fill out a speedy enquiry form here. To receive information or to ask for advice, please call us on 01384 78004. Threaded Round Eye Plate Overall rating: 5 out of 5 based on 6 reviews.